Hopes Edge Farm » First day of CSA, starring kale! First day of CSA, starring kale! Today was the first CSA pick-up and we have been looking forward to this day and to seeing you! In your share this week, you will find lettuce, kale, green onions, parsley, and spinach… a very GREEN week indeed! People picking-up today also had the option to help themselves to some beet greens which we put on our surplus table. They were meant to be part of your “official” share but we had a bit of a hiccup with our fridge which was hibernating all winter and has a new (much quieter, did you notice?) motor. Things got a wee bit too cold in there after we turned it on and those poor tender beet greens froze a little bit, so they weren’t looking quite as glorious as when they were pulled out of the ground. Still, they are delicious cooked, we just had them for lunch in a spanakopita (beet-okopita) and it was quite tasty! We took filo pastry and filled it with the steamed beet greens, Appleton goat cheese, and a couple eggs, easy as pie! 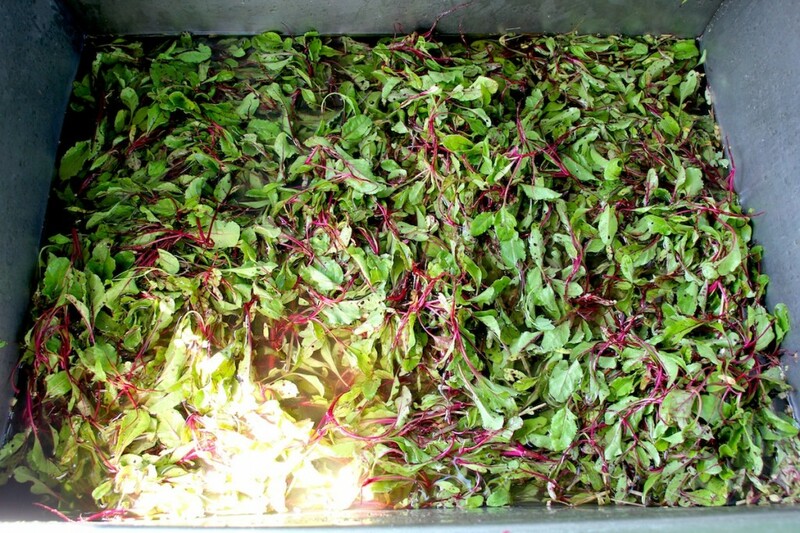 Here are the beet greens as they looked at their prime, a few moments after harvest. Things on the farm have been busy and we are all relieved to have a break from the rain. Sadly, some of the potatoes that the Waldorf school students so kindly helped us plant a few weeks ago rotted in the ground because of all the rain. But many survived, and we’ll be planting more. Those that made it and whose green tops are starting to poke through are already dinner for the frisky potato beetles, who are mating like crazy and laying their eggs under the leaves. So we have been doing the rounds, picking beetles left, right, and center. As we do this, Tom reminds us how easy it is to enter into a “war mentality” with these critters, and that we should strive to find our Buddha nature even though we are pulverizing the little buggers (and usually while they are caught “in the act”, at that! …though it’s not a half-bad way to die as Amanda pointed out.) After all, we human beings can be so possessive, and the potatoes, the soil, the air, none of it belongs to us, and all creatures deserve a tasty dinner. But our goal here is also to make YOU, dear shareholders, also have a tasty and healthy dinner on your plate. So in trying to find my Buddha nature, I have been pondering what is the least painful way to die for a beetle. I don’t like squishing them because the juicy crunchiness of it all makes me feel kind of queasy, so I spent yesterday afternoon putting them in a bucket trying to conjure up how to commit my crime in the kindest way possible. I opted for the boiling water method, which I figure is a fast and relatively painless way to die, but which Tommy said is a bit sado-masochistic. If any of you out there have any other ideas, tips, please let me know in the comments section below. I hear a local farmer gets them with a vacuum cleaner. Yikes. Sounds very ghostbusters. 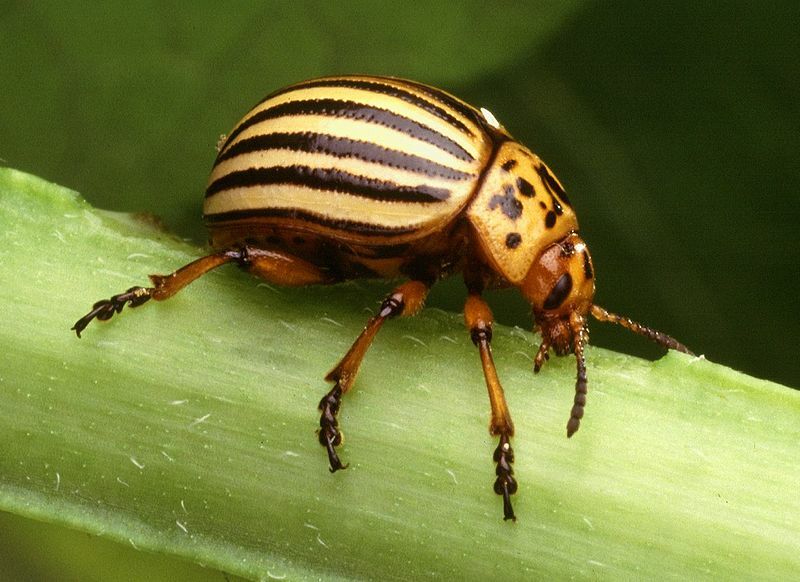 Next week, MOFGA’s apprentice workshop is on ecological pest control, hopefully, I’ll learn a few new tricks! Aside from the massacring of potato beetles, we have also been transplanting cukes, basil, brassicas, peppers, trying to keep weeds under control in the turnip, leek, and brassica beds, trellising peas and favas, trying (desperately) to get the large hoop house finished, and most exciting, getting the flower beds ready. In fact, we did this on that insanely hot day. We were almost delirious by the end of it. Except Tom. He was quite a sight to see, in full artistic concentration mode, because as Tommy says, he is like a painter at work: the tray of flower seedlings is his palette and the soil his canvas. I know I’m not the only one who can’t wait to see the colourful picture he has painted! Before I bid you good night, and since kale seems to be the star of this week’s share, I wanted to share a couple kale recipes with you. One of my personal favourites, and one I posted on my blog last fall, is for massaged kale salad, which you should try because it is delicious and super healthy (the kale is raw but it is “cooked” by rubbing it in lemon juice, sea salt, and olive oil). Click here to see the recipe. Another one which Tom recommends is kale chips or roasted kale. Click here for a fabulous recipe from one of my favourite bloggers. Don’t forget our first potluck date has been changed, it is no longer June 29th but has now been moved to July 6th. We hope to see many of you there!